really all about? Today, just about everybody in personal services seems to have become a coach. Is it just another modern expression or a buzzword for something that other disciplines were already providing? This book seeks to arrive at clear answers to these questions, providing a thought-provoking and insightful narrative that is likely to leave behind a lasting impact on the industry and its potential clients. Christopher Weber-Fürst, Germany: "The best book about coaching and should be read by every HR person involved in organisational coaching programs. And of course if you are a coach or thinking of becoming one. To become a leader is synonymous to become yourself. So easy to say and so difficult to do. The Solution: find a coach! So, we find a coach. They empower us. We learn to take full responsibility for ourselves. We create what we want. We master our life. But how do you find the right coach? And what do you really know about coaching? Arun Kohli’s book gives you all the answers. He classifies the difference between managing and leading and that coaching always person centred learning through self-reflection. Enables the client to better understand hers or his own views and perspectives. Coaching is a method to impact your leadership behaviour leading to better relationships, better efficiency, better performance and better contentment in one’s own life. Coaching should provoke you into thinking about new ways and triggers learning through reflection. It has nothing to do with outer game, only the inner game. It is a methodology that can be used by any profession! Kohli ‘s book includes all aspects of what you need to know about coaching. How to create your personal coaching style. What I particularly like is his comment on goals:” Goals may cause systematic problems in organisations due to narrowed focus, increased risk taking, unethical behavior, inhibited learning, decreased cooperation and decreased intrinsic motivation. Use care when applying goals in your organisation” Another very interesting perspective he draws upon is the fallacy of coaching. Coaching can trigger a change and the change is due to learning and is dependent on the coaching method and the acceptance of the method by the learner. Not the coach. 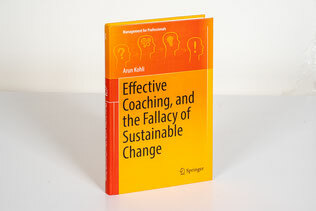 So when we as coaches promises sustainable change to our coachees: how can we do that? A change that holds forever would be static and that is not what we want. We want a transformation. Not change. And this internal process of transformation is based on our values system. I could not agree more. He brings in all we need to know about coaching. Intercultural coaching, mindfulness in coaching, the basis of coaching and guiding principles, a very useful survey of coaching trainings and coaching companies, many very interesting case studies, his personal business experience, coaching as mindset, the coaching process: what is effective coaching, optimum length, who needs a coach? Finally Kohli sums up what he and Sir James Whitmore and for sure from my side too: coaching is a method even Socrates used 2 400 years ago and will exist for as long as humanity has understood that there exists and effective method to learn and teach and where there is a behavior that encourages people to grow and flourish – and that is coaching." - An interview with Anja Wetter of the Fernuniversität in Hagen (in German) 'Pyschologiestudium zwischen München und London'. - A write up in Münchner Merkur, a German Newspaper in Munich.